Socks aren't my only summer project. About a month or two ago, I made a trade with an alpaca breeder. I was given a very generous supply of Alpaca fiber in exchange for some finished items to show their farm visitors. This little guy is the first of those items; a little stuffed alpaca from a Fiber Trends pattern. 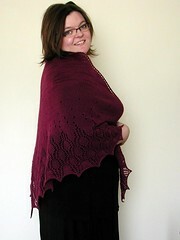 I had to look around a bit to find this pattern, but finally found it at Mielke's Fiber Arts, LLC. My little alpaca measures 11.5 inches tall and was a lot of fun to make. Although I've dabbled with raw alpaca before, I decided to do a little research before I started spinning, especially since the final product wasn't for me. In the Spring 1994 issue of Spin-Off Magazine, I found an article by Jane Fournier, which provided all the information I needed. This is Huacaya alpaca, and the fiber is luxuriously soft and silky. Even though it has some crimp to it (about 4 - 5 per inch) it requires plenty of twist to hold it together. This fiber is a little too long for handcarding, so I drum carded the fiber. Drum carding is also quicker, which was fine with me. It is a lovely chocolate brown color with sunbleached tips. The tips were sound, as was the rest of the staple. It did contain a lot of VM (vegetable matter), nor was it a spinner's shear, which meant there was a lot of unevenness of length and long second cuts. The pattern called for a worsted weight to bulky weight yarn. My singles were about 18 wraps per inch. The fiber was slippery to spin, so I started with my largest whorl and treadled slowly. I used the short draw (worsted) technique to better control the evenness of my singles. Once I felt comfortable with the fiber, I switched to a whorl one size smaller. Plied, the yarn measures 10 wraps per inch. Jane Fournier's article recommended that for knitting, the yarn needs to be balanced, as otherwise it tends to produce a bias in the knitted fabric. Even firmly spun and plied, the yarn has a lovely hand. I knitted my little alpaca on US10.5 needles. It is all in garter stitch with short row shaping. An opening was left between its back legs, to enable stuffing it later. He was then fulled in the washing machine. Fulling is the term used for felting an item after it has been knitted or woven. It only took five minutes of agitation in a washing machine filled with hot soapy water to get the results I wanted. I stuffed him with shredded plastic shopping bags to shape him for drying, and later used polyfil for the permanent stuffing. I stitched up his back opening and added some embroidered eyes. He looked cute, but taking a stiff bristle brush to him really gave him some personality. He looks more like the fluffy Huacaya alpaca that he was created from. Of course, these alpaca projects will put a dent in my Shetland spinning time. And then there's that bag of Merino. And the Polwarth which remains lonely and untouched. *sigh* At least I'll never have an excuse to be bored. The stuffed alpaca is precious! I have some Huacaya alpaca fiber I've been meaning to get back to...your yummy pics just gave me motivation! I've never been able to bring myself to full handspun yarn. I guess it's a mental block of sorts - I figure I spend so much time to prepare fiber and spin it so lovingly, then to lose all stitch definition in the wash... I can't do it! Boy, I sure do with I'd taken the time to do a little research before carding and spinning alpaca the first time. It is a lovely fiber, but it would have been so much the better had I been prepared for the slippage! Such a cute little alpaca you have there!!! How adorable!! I just bet June won't be able to resist now that she's seen your alpaca. Our Thursday evening spinning group created a multi coloured Alpaca, that won the people's choice award at the Wild Fibres Conference. You can search for Edmonton Weaver's Guild or use my website and click on the EWG link. Great job, it is super cute. Leigh, that is the cutest thing! So darling! I want one!! You are a very talented lassie! I agree...the doll is super! 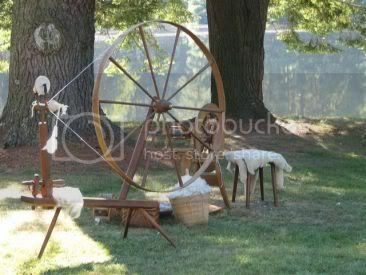 But I have to say that I really think the spinning/plying work is fantastic too! Did you tell CatZee for me that I came up with three beeyootiful things about kitties just for her? Thanks :-) T.
It should not be left unsaid that looking at that wonderfully soft yarn (love the color, too!) spurs the desire to dig out my knitting needles , stay up all night knitting 'cause it's just too good to put down. What beautiful yarn (again!) and what an adorable little alpaca! I wasn't familiar with that site, so I'm happy to learn of a new source for patterns for cute little critters like yours! Leigh, that little fellow is so nice! it took me a moment to realise that it wasn't a photo of a real alpaca:)) your yarn reminds me of the two extremely large bags of alpaca fibre I still have here (and there is 3 kg of top still to come from my last order...) if you ever get the chance to try some Suri too, go for it - it really is a very different thing to spin! Leigh - Have you found this alpaca has very little "elasticity" to the final yarns? Years ago, while living in Germany, I spun quite a bit of alpaca, but I noticed the yarns did not have the springiness of woll yarns. I sold the skeins, so never knew how they faired in end use, but the rage in Europe at that time was alpaca sweaters. I would notice that if a woman wore the sweater, when she would take it off you could tell exactly which side was the front - and not from looking at the labels either. (lol) I don't think the alpaca was the Huacaya, as I saw no crimp in the fiber either. And, again, I bow to your "awe-some" yarns! Just breathtaking, as usual! You go, Girl! Thank you one and all for your kind compliments! I am very happy with the way the little guy turned out. Kristi, I'd love it if you included some techie spinning stuff in your posts. I learn a lot this way. Kathy, you're right, there is practically no elasticity to the alpaca yarn. I'm working on a knitted alpaca scarf at the moment, but I'm afraid a sweater wouldn't hold its shape very well. Bettina, you'e reminded me that somewhere in my stash I have a bit of raw Suri. Now I'll have to go dig it out and give it a try! The stuffed alpaca is full of personality! When I first looked at the photograph, I imagined that he was a needle felting project! Thank you for the link to the pattern! It looks like fun!